A Little Ramble: In the Spirit of Robert Walser is a project initiated by the gallerist Donald Young, who saw in Walser an exemplary figure through whom connections between art and literature could be discussed anew. He invited a group of artists to respond to Walser’s writing. 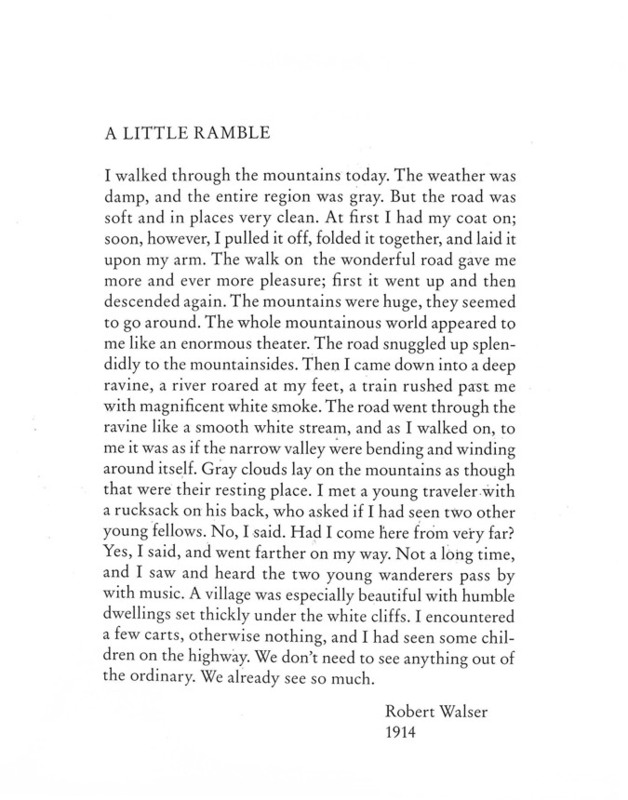 A Little Ramble is a result of that collaboration.The artists have chosen stories by Robert Walser as well as excerpts from Walks with Robert Walser, conversations with the writer recorded by his guardian Carl Seelig. Much of this material appears in English for the first time. Accompanying these pieces are over fifty color artworks created specifically for this project, a preface by Donald Young, and an afterword by Lynne Cooke. Original art by Peter Fischli & David Weiss, Thomas Schütte, Moyra Davey, Tacita Dean, Mark Wallinger, Rodney Graham, Rosemarie Trockel, and Josiah McElheny.